The Addington Article: The Green Team Trip to the Strickland St Gardens for World Environment Day. The Green Team Trip to the Strickland St Gardens for World Environment Day. On Friday afternoon the “Green Team” walked down to the Community Gardens on Strickland St to find out some tips for our new school vegetable gardens, and to help celebrate Environment day. 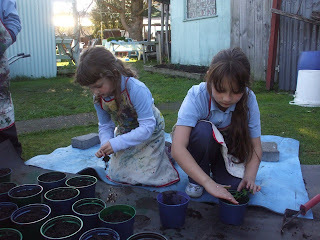 The people who work there, told us that seeds need to be sown at twice their size into the soil, and that we could sow broad beans and sweetpeas in our new school plots. We looked at their composting heaps and the size of their vegetable beds. We have started our own compost heaps at school, and collect foodscraps from the classrooms and lunch area. Mr Sinclair, our caretaker, puts the garden waste on the heaps too. In the spring we want to put our new compost onto the gardens to help our vegetables grow. 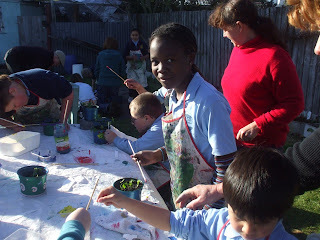 At the community gardens we helped plant parsley into pots and then painted the pots to take home. 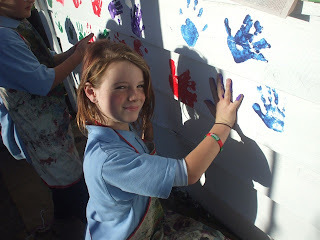 We made coloured hand prints on a wall to celebrate Environment Day. We had a busy afternoon, and even tried some rhubarb and apple muffins, and parsley pesto. They were yum!! We are all looking forward to planting in our own school vegetable plots when they are made over the next few weeks.